A very lovely sunny and warm autumn day: we pottered up and down the valley with the service trains and the public wandered happily around the platforms inspecting our quality retail products as well as our rampant begonias. In several places some painting went on, and the Duty Conscript was introduced to the wire brush in connection with the CHPR water carrier. Down the yard, the DMU team appeared to be having a seating day, and the class 108 received a large number of "new to us" seats and so this unit has very nearly had completely replaced upholstery in the passenger area: with a little further tarting up it will no doubt be a credit to us, particularly once we've washed the antimacassars. In the shed the main thrust of the day was the construction of the down side staging, which will enable our talented fitters to put on a show of their own, as if they don't spend enough time singing as it is. 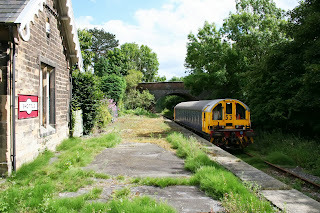 We were blessed with glorious sunshine here today at Derbyshire's favourite branch line. The Duffield and Ravenstor services enjoyed a steady stream of passengers throughout the day. Down the yard the LMSCA and 8F group continued their respective restoration projects. 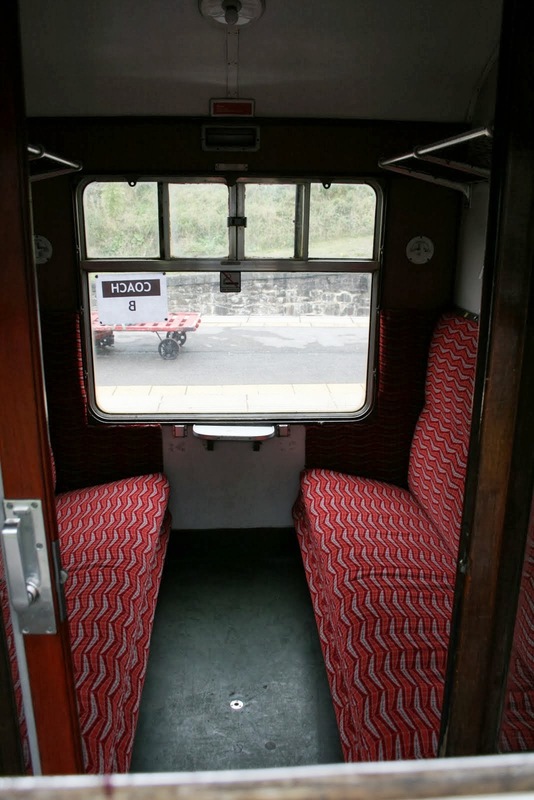 The DMU team tackled a number of tasks including the fitting of new seats in the class 108 and three annual services. In the maintenance shed Chris started erecting the second platform. Finally we welcomed eight new volunteers on their induction and PTS course and wish them a long and happy time with us. Another most pleasant day with the dmu team hard at work, as illustrated, as they resolved a problem with 51505's vacuum cylinder and restored it to operational use. 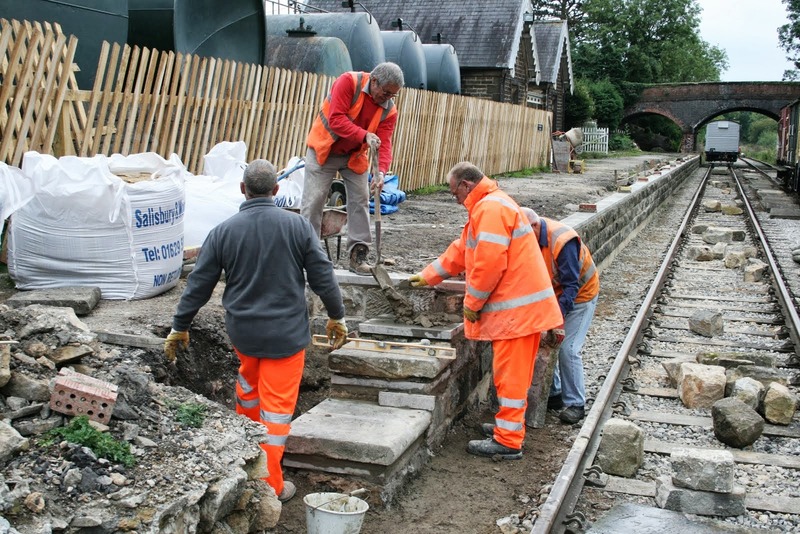 The PWT had a tidy up day after the relaying at Cemetery Lane with a gathering of three grades of sleepers, the first to be confined to rest in peace, the second to be offered for gardens and the third which will be reusable in non passenger lines. The Rudd was also emptied of waste on the Incline bank sides and this job can now be deemed concluded. The Pullman Buffet Car had quite a good day as visitors were encouraged by the winter sun and the Booking Hall continued to revenue generate. Contractors found the source of our water leak and effected repairs but I fear a larger investment will be needed to replace a pipe, probably installed by the Midland Railway, to be replaced. The Filing Fairy was in operation until such time as she was uptitled to Assistant Surveyor to provide support, as ever, to her husband as he grapples with the proposed new entrance to Shottle station. A copy of a letter is attached that reflects on our leading ambassador. This sort of impact made by Richard is of inestimable value to our enterprise and he should be thanked profusely! Today saw a further modest increase in our fortunes as we hosted some trolley testing on the Incline and a further visit by our loyal "walking stick" clients. The PWT completed a final fettling of the track under Cemetery Lane bridge and the product of their endeavours is illustrated. The team also realigned the track on the "pit road" of the Maintenance Facility which will allow further staging to be erected on the west side of the shed. An extremely generous offer was received to fund the third element of the Capital Projects programme which consists of the further platform extensions at Wirksworth and Duffield leaving a further 9 segments to fund to ensure our continuing development. The Pullman Buffet Car and Booking Hall had quite a productive day. Santa is proving to be a popular On Line product again with a group of nine booked today. PS - For those of you awaiting a PTS course there is one planned at 1500 this coming Saturday. As our season gently winds down we experienced the last Tuesday service of the year. The weather was quite delightful and our single unit railcars dealt with the traffic on offer. 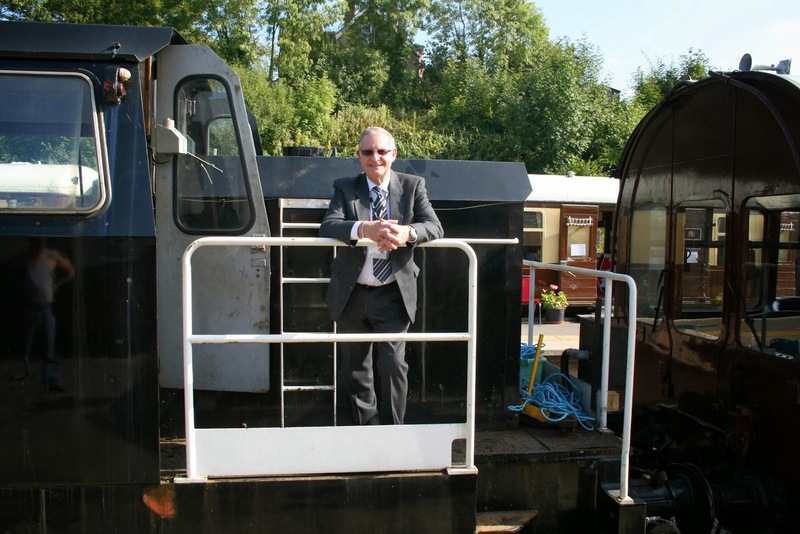 Amongst our guests today was Malcolm Goulding who was preparing for his retirement on Thursday after 51 years on the railway. Presently he is a driver with East Midlands Trains who had organised a number of events for his last week including some time with us. Malcolm is pictured on L J Breeze, one of the few varieties of motive power not experienced in his long career. Tom looked after Malcolm and his EMT colleagues and was thanked for his attentive care - I feel another EMT cab ride is available. The service today was supported by the train crew, Booking Halls, EVRA Shop and Pullman Buffet Car who all delighted those that travelled with us. Fred and Iris made a welcome return to cleanse the Mess Hall inhibited by an intermittent supply of water due to a major burst at the top of the station approach. Efforts are being made to source a contractor who can put matter to right as, unfortunately, the burst is our side of the meter. The LMSCA received and fitted further new steel panels for the Third Open and made impressive progress with the flooring in the Brake Third Open. The DST fettled Henry Ellison for its next outing and tended to more burning on Cathryn's boiler.There was much shunting to place our locomotive hauled stock into winter slumber and store a couple of dmu bogies so they won't be in the way for a while. Even more driver experiences were booked and the diary is starting to fill for 2014! Progress Monday 23rd Sep 2013. Another warm day with just 2 p way workers today. A reported problem with turnout 14 at Wirksworth turned out to be dry slide chairs so all the hand points at Wirksworth have had attention with the grease brush and oil can. All the Wirksworth ground frames have also had their 3 month lube, inspection and fpl check. New wiring and lamps have been fitted to the new platform extension after complaints over the lack of illumination. Mike has been out with the flail and managed to cut back both sides of the track between milepost 1371/2 and 1361/2. There is a bad water leak in our supply on the access road and as a consequence the water has been turned off at the stop tap near the road so will need turning on again in the morning. There were no dirty dishes in the mess room this morning (amazing) and we have left it the same- lets see what its like on Wed morning after the Tues team have had a go at it. There is a large group of volunteers who are bone idle and have wives and mothers who run around cleaning up their mess- well, not here, so clean up after yourselves or the cups, pans, plates,cutlery and the bowl complete with the filthy water goes straight in the wheely bin. Oh, and whilst on the subject can people who use the hand wash sink in the mess room kindly clean the sink and not leave filthy hand cleaner splattered all over the place- or perhaps a tin bath on the platform might be more your scene- enough said, stop behaving like pigs. A delightfully sunny, warm end-of-summer day saw us chugging up and down the valley with the loco hauled set, to the considerable pleasure of all concerned. We also had quite a good turnout of people just visiting the buffet and sitting around in the sun, as well as a walking party returning to Duffield after a day of rambling around the shire. Down the yard, the DMU team continued with their new toy and having stripped out the junk, cleaned its interior, or more accurately, moved around a quantity of spiders and a number of displeased ants, they then began to disassemble the cab, which is one of two major areas requiring interior attention, the other being the guards compartment. We will say very little about the exterior, except that its does appear to have an exterior. The cab is now disassembled along with 40 years of BR grime and Ben Field is being hosed down in a garden in Brassington even as we speak. Today proved to be somewhat more pleasant than the morning allowed for. We were sufficiently busy that the till bell could be heard ringing from the parlour of the Malt Shovel, rather to our surprise. Passengers were both happy and complimentary about the service and the class 33 chugged up and down the valley with little effort. Will Booking Hall staff please be advised that in the interests of good timekeeping, late arriving passengers may be directed straight onto the train where they may purchase their tickets from the Ticket Inspector. Will guards please note any activity in the Booking Hall before departure. Down the yard, the LMSCA carried on with sanding the Third Open and some associated work in the Brake Third. The Austerity team spent most of the day astride their beast with what appeared to be a cutting torch, and nearby, the class 31 was made ready for its day of activity tomorrow. Outside the shed the DMU team assembled the National Railcar Seating Museum and very nearly exhausted themselves moving the entire contents of newly arrived unit 50253 from one place to another, partly involving changing some seats in the class 108 and partly involving moving the European Formica Mountain out of the guards van. It can now be revealed what has occupied us for the last two days and brought a little joy to our finances. 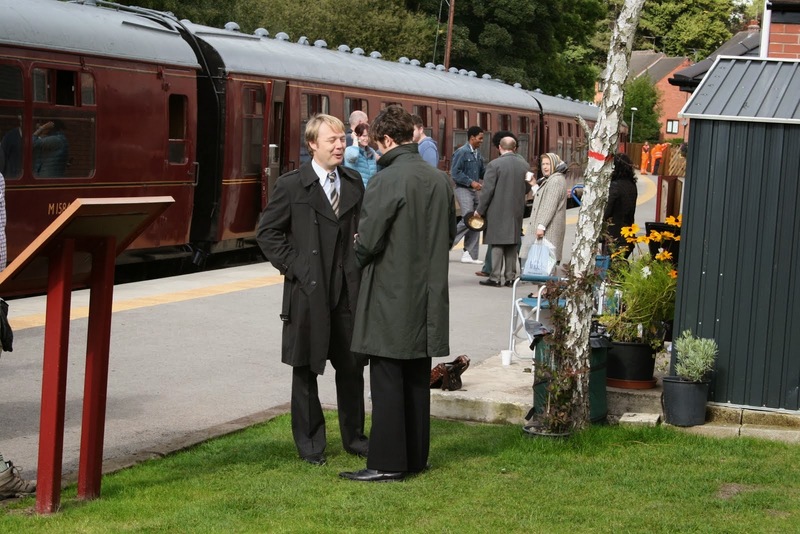 The BBC requested our assistance for a railway scene in a new spy drama entitled "The Game" that needed our locomotive hauled set where all the action took place within the interior of the vehicles. 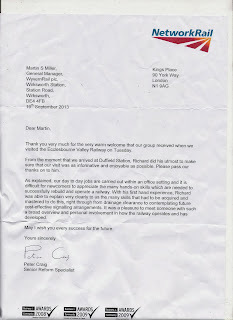 As I write this the project has been completed and the train is returning to Wirksworth. This has involved very long days for Mick Thomas, Graham Walker, Tom Tait, David Newby and Rodney Thorne with the assistance of Adam Ledger yesterday and Mike Jacobs today to ensure the Class 33 behaved itself. I express my gratitude for the professionalism demonstrated by our team who delivered all that was promised. The train today had a staggering 90+ passengers comprising actors, extras and technicians as we replicated a journey between London and Birmingham in the 1970's. "The Game will follow the activities of a secret committee investigating a potentially devastating Soviet plot, codenamed Operation Glass. The head of MI5 - codenamed Daddy (Cox) - assembles a team of top operatives, including troubled but genius interrogator Joe Lambe (Hughes) and the rakish head of counter-espionage Bobby Waterhouse (Paul Ritter). Making up the rest of the team are Waterhouse's quick-witted deputy Sarah Montag (Victoria Hamilton), her husband Alan (Jonathan Aris) - an expert in bugging and interception - Special Branch detective Jim Fenchurch (Shaun Dooley) and secretary Wendy Straw (Chloe Pirrie). Each episode, the team will uncover a new Soviet sleeper agent working on Operation Glass in the UK - and each name on their list brings them one step closer to understanding Operation Glass. Toby Whithouse promised that The Game will be "a thrilling mystery, with exciting and complex characters"." Tonight had the added factor of a pre-arranged evening charter for Derby High School who were using it as a fund raiser for some of their students visiting Africa. 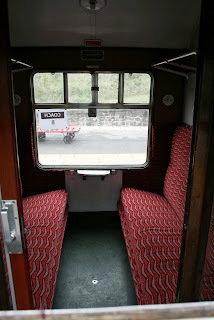 They were conveyed on the returning "film train" to Wirksworth and were to be returned later this evening by the "Bubble Car". Back at base the LMSCA continued their efforts with the Third Open and the PWT completed the fettling of Road 1 re-laid over last weekend. My thanks go also to Alan Taylor and Mick Kingsley who responded to an emergency call to try and prevent sheep straying into the path of the film train. The Filing Fairy pursued her unending task and husband of FF began to survey the proposed new pedestrian entrance to Shottle station. The Pullman Buffet Car and Booking Hall had a reasonably productive day. Quite a day with the "A" team undertaking a task that is still going on as I write this with the full details being revealed tomorrow. Suffice to say that we are earning some serious money! The PWT attempted to find where sheep were getting onto the line at Shottle with little success as these ingenious animals seem to melt into the background when sensing they may be in the wrong place. Their main activity was the jacking, packing and slewing of the trackwork re-laid over the weekend with some success. The line was also patrolled from Idridgehay to Wirksworth. I did fail to mention the SBT assisted by Mike Billings on the Komatsu who achieved the placement of some 57 ft of platform copings at Shottle as this project gently moves forward. The frames of Cathryn together with "her" wheels were sandblasted today and the Pullman Buffet Car welcomed a few folk brought out by the periods of sunshine. 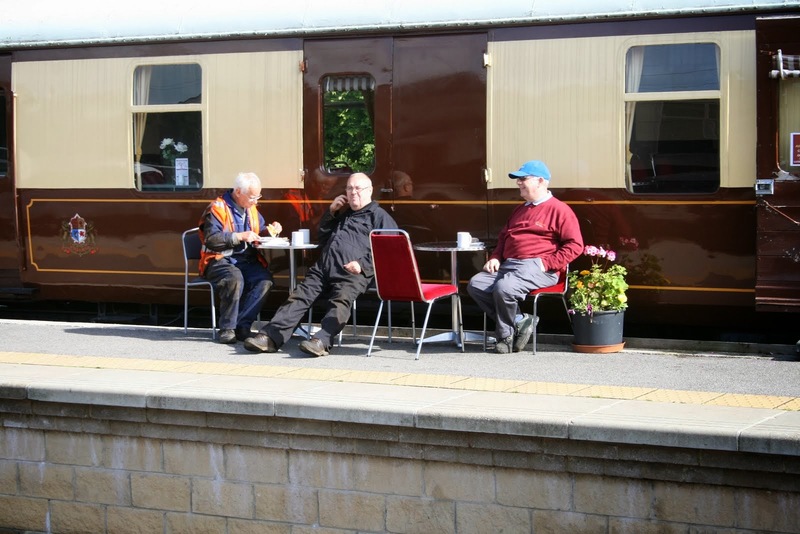 It was a delight to have a conversation with Roy and Les who are as energetic as ever and regaled me with the tales of their latest coach excursions to a variety of heritage railways. All I can say is never subscribe for the same tour as it all seems to go spectacularly wrong. A reminder of one of their locos is attached and many of you will recognise the location and marvel at the amount of ballast which we seem to be able to afford then. The Booking Hall has had another delightful revenue earning day with a further two online diesel experience bookings being made and paid for. You may be aware that we had a large team for the faculty of Railway Engineering of Birmingham University lead by Professor Felix Schmid from Friday evening to Sunday afternoon. To occupy some 40 people productively is quite a challenge and I thank all of our team who turned out to mentor the students. Catering also responded with two late nights and a variety of dietry requirements. I am assured that visitors from, literally, all around the World found the process edifying and better understand the working conditions of the people they are likely to manage after achieving their Masters degrees. They have booked a further round of activity in 2014. As always on a Tuesday there are many different activities underway which for me started at 0755 when the diesel fuel delivery expected yesterday was apparently on our doorstep. A slightly less than warm reception saw it delivered a little later in the day with our two diesel locomotives filled for their activities over the coming week leaving a little to supply today's service trains and the Komatsu. The Komatsu set off for Shottle and achieved with the SBT some 57 ft of platform coping stones placed in the correct position in between the passage of service trains around the Shottle loop. Track patrols were achieved between Shottle and Duffield and Fred & Iris gave the Mess Hall at Wirksworth their customary good cleanse. The DST serviced Henry Ellison for its next driver experience role and tended to Kathryn's longitudinal stays and brakework. The LMSCA refurbished a compartment of their Mark 1 SK with fully renovated seats covered in a mocquette called "Aeroplane" or "Boomerang". It is a sobering thought that just the one compartment illustrated cost £1000! We welcomed a number of interesting visitors to today's service including the "2012 Club" comprising primarily of former members of Derby's Carriage & Wagon works who were involved in the testing of newly built dmus on our line. They were ably hosted by Graham Walker and very complimentary about the Railway some 40 years on. A further three visitors were also ably hosted by Richard Buckby who were from Network Rail with one of the participants was involved with WyvernRail when it had aspirations to take over the Midland Main Line some time ago. 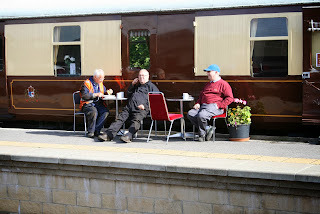 My thanks go to the train crew, Booking Halls and Pullman Buffet Car who ensured all our visitors were welcomed. We were dry, then we were wet, then we were really wet, and then the sun came out. This brought us a modest number of passengers before the heavens opened, but in general we had a quiet day down the line. 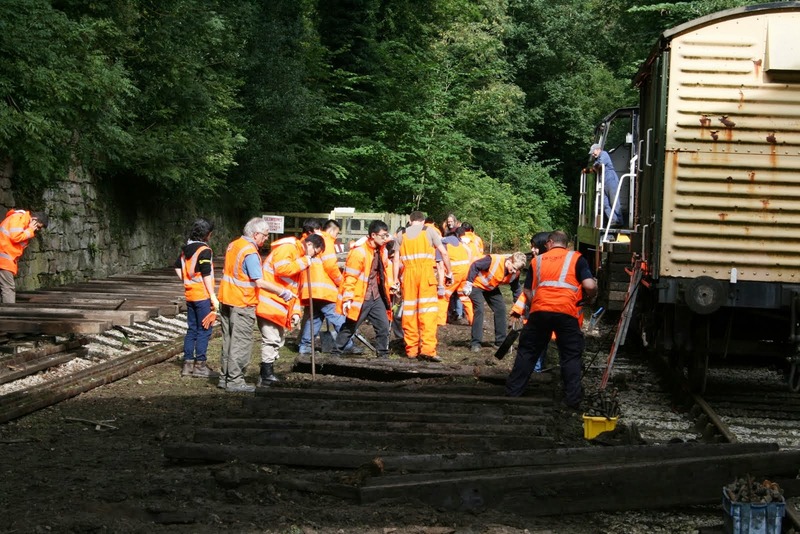 In the yard a convention of P-Way trainees from Birmingham University held a large orange confabulation under Cemetery Lane Bridge and a number of panels were laid out in a renewal of about 100 metres of track. In the shed, the LMSCA carried on with undercoating their Third Opening as well as having a book sorting. 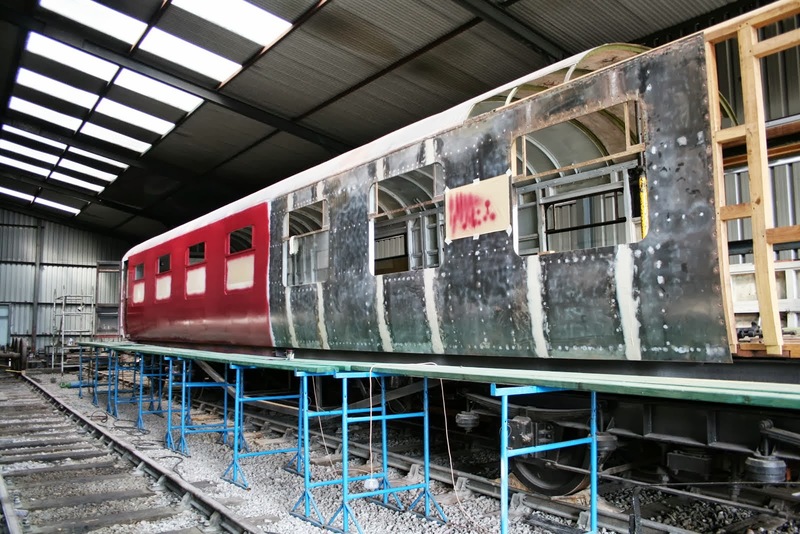 Nearby, the DMU team undertook some routine varnishing of the cab windows of the Bubble Car before evacuating themselves into unit 51360 for its last journey with us on the 16.20 service train. It is being transferred to a well-known railway somewhere in either Gloucestershire or Warwickshire, depending on where you are standing at the time. A quiet but productive day saw our guests from Birmingham University commence their re-lay of road one under Cemetery Lane Bridge. Down the yard only one of the DMU team was in attendance due to the rest of the group enjoying a 'boy's jolly' at Alton Towers. The 8F group resumed their work on the Kathryn's boiler and the LMSCA continued their restoration work. 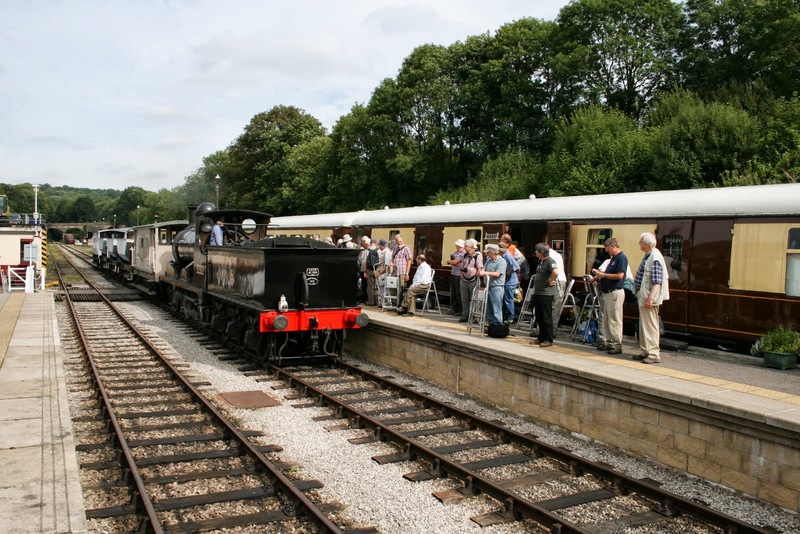 The scheduled train services ran with fairly good passenger numbers and the model railway proved popular with our younger visitors. Finally we welcomed some more relatives of Henry Ellison who had travelled from Bradford to see the engine. A pleasant if occasionally slightly damp day with our steam experience guests happily chuffing up and down. In the shed, the LMSCA and their close personal friend carried on with the framing and sanding of the Third Open. hauled stock which is shortly to be used for a top secret project involving a corridor. Meanwhile at Duffield the top secret project involved Rodney filling some potholes and doing some painting of his own. The VCT were in operation south of Hazelwood and there were several electrical jobs accomplished at Wirksworth. The M1M continued to upgrade the CK and pursue the renovation of the EVRA SK. The Pullman Buffet Car had a quiet day and the Booking Hall continued to receive experience bookings and conducted research into the acquisition of walkie talkies for our contract next week. A peaceful and satisfactory day. A fairly gentle day after the many excitements of the last few months. The PWT set off for Shottle south loop points and further aligned the trackwork there. The SBT were hard at work on the platform project and are illustrated installing the steps at the north end. At base the LCC cleansed the Bubble Car and Iris and the Filing Fairy pursued her quest with more vigour. 100 sleepers arrived for the relay project this weekend where students from the University of Birmingham are put through their paces. The Pullman Buffet Car traded quietly and the Booking Hall looked after the seemingly insatiable demand for driver experience days. Capital Projects Fund - Take 2! The system didn't like my attachment so I am cutting and pasting! Many of you will know that a great deal of heart searching has been going on as the full effects of running a nine mile railway are sinking in. We trade ever more successfully and, with the exception of last year, have made a "profit" that has allowed modest investment in capital projects over the years. The significant contribution by our shareholders and grant givers has allowed the really large pushes to Idridgehay and then Duffield to happen. It has become clear that our "trading" will not generate enough funds to invest in very desirable projects to allow our Railway to further develop and the present financial climate has all but removed grants as a source of income although shareholders continue to be very supportive. Where grants are still available many require us to demonstrate our commitment by making a partial matched contribution from our own sources. Thus it has been suggested we launch a Capital Projects Fund where anyone can make a weekly or monthly manageable contribution to allow us to continue to move forward. The Standing Order should be made payable to WyvernRail plc at NatWest Sort Code 60-14-15 Account Number 29964024 using your name as the Reference/CPF. A suitable form is found at the bottom of this letter. Please hand this Standing Order Mandate to your Bank for Processing. I attach some detail of 10 Capital Projects we need to undertake to drive our enterprise forward. We recognise we cannot fund these projects out of revenue and need to be yet more creative in fund raising. Thus we now have shares, ShareSave, the CPF and straight donations as ways of helping us to advance. A pleasant day if a little thin on the ground again. P way continued with the turnout at Shottle south after dealing with the loading of L&Y loco at Wirksworth. Removing the draw bar pin to separate the tender from the loco was a bit of a challenge with the loco left on a tight curve, However success prevailed but then the buffet sprang a leak which delayed us further arriving at the work site at 11.45 am. Thanks to Dave Newby for spending a couple of hours putting it right. Buffet was open but a little damp. A reminder of time slipping by was the receipt of our first on line Santa booking today! The service had an end of season feel about it with numbers easily accommodated by our single unit railcars. 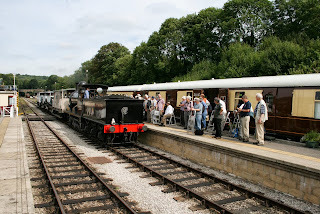 It was nice to receive a couple from the Wensleydale Railway who had a frustrating visit to the Foxfield on Sunday where, I'm assured, for the first time in 45 years they weren't able to operate a train due to steam and diesel failures. The train crew, EVRA Shop, Booking Halls and Pullman Buffet Car all achieved respectable results given the low numbers carried. Fred & Iris gave the Booking Hall their customary clean and have now taken over the maintenance of the hanging baskets and flower beds at Wirksworth as Dorothy takes a well earned retirement although I'm assured that baking will continue for her special boys! The DST undertook routine maintenance of Henry Ellison and prepared Cathryn's frame for the attentions of a sandblaster. Nathan the Paint sparkled up the white fencing at the north end of Platform 2 to good effect and the LMSCA started to apply the roof hoops to the Third Open in addition to the application of more body filler. The dmu team created an ingenious way of recharging the batteries of the centre car of our three car set and David N investigated lighting the platform extension at Wirksworth before looking into problems with Idridgehay level crossing gate lights. Today's photo illustrates an unusual excursion on the 27th August 2008 which can now be revealed - we dared not go much further south for fear the battery loco would fall off given the condition of the track at that time. PS - Those of you who have been troubled by Hylton's serious predicament in the Philippines necessitating much cash to bring him home need not worry. He is selecting a partner and expresses great pleasure in the process. His ebony American Express Card is taking care of all his needs. Sorry, the live webcams appear to be down at the moment. Our team will be looking at this as soon as possible. A pleasant sunny Festival day here in Wirksworth where we were rather more exhausted running around the car park than we were providing the service trains and the steam experiences. Down the yard, the DMU team stored themselves away again and disposed of assorted Complete Railway Aggregate Piles which had been hanging round the shed like a bad smell. Nearby, the austerity team had a rather similar experience, although theirs extended to getting their pistons out, their sandboxes off, their brake hangers down and their eccentrics cleaned, as if we weren't eccentric enough. Meanwhile the Festival thundered along in the background to the ringing of church bells and the inspecting of people's houses in the name of Art. A dull start to the festival weekend but the midday sun soon brought out the festival visitors to Wirksworth station. The art exhibition in the pullman set enjoyed a steady stream of patrons throughout the day. Down the yard some shunting took place in preparation of 52322's departure on Monday. The class 33 received some further fine tuning and the LMSCA continued their carriage restoration. Our drive a steam engine taster opportunity proved popular and attracted young and old onto the footplate. This evening's skiffle and fish and chips charter proved an unqualified success. The attached photo is of a packed Duffield platform full of people enjoying our hospitality. A special thanks to all the volunteers who worked hard to make this evening's event so enjoyable. guests coming from as far afield as Holland and Rugby. Naturally the ones from Holland got here faster. Various preparations were made ready for the breathless excitement of Wirksworth Festival including putting the cones out and assembling the parts for the National Gazebo Museum. At Duffield Rodney mowed the lawn (last night). A reminder: All staff parking on the Ballast Dock this weekend please. Due to a late cancellation we have some steam driving experiences at an advantageous price. Take a look at www.e-v-r.com/steamexp for more details. This price is only available online! Appeal for loan of Gazebos! We could do with the loan of a couple of Gazebos for the Festival Weekend as the forecast is not encouraging. If you have one tucked away and can delivery to Wirksworth Station today or early Saturday it would be most helpful. As the "blog" struggles with two photos at a time here is one of the Third Open partially sprayed. The last day of action for 52322 with us saw a second photo charter involving another lengthy day for the train crew. I am grateful to John Evans and JHT who hosted quite an eventful and somewhat stressful day. 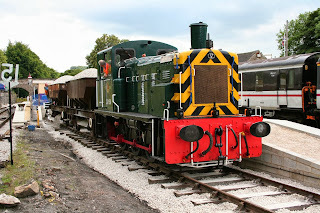 The dmu team lead by Graham rapidly fitted the two repaired starter motors to LJB and we were in business again to the acclamation of all concerned. 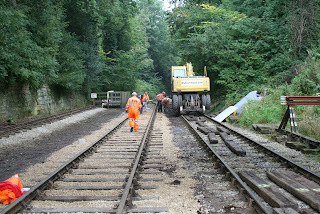 This allowed two tasks to be accomplished by the PWT in advance of next weekends track relay under Cemetery Lane bridge. The emptying of the Rudd on the Incline and loading up of a Dogfish with ballast from the Wash Green dock. This together with some pre - preparation for the evening photo shoot showed the usefulness of this locomotive to us. 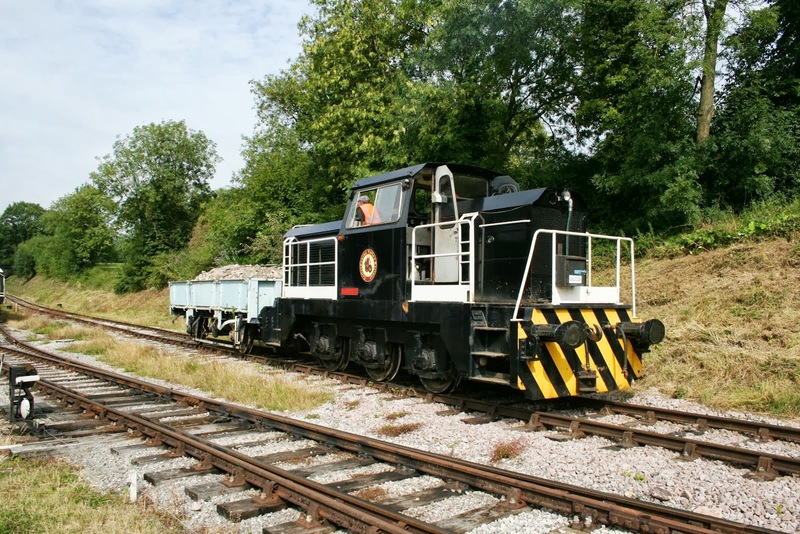 The PWT also arranged for the surplus coal on the Dust Dock to be dumpered away and our fleet of road/rail machines filed away to maximise car parking space for the Festival Weekend. In connection with the Festival a photographic exhibition was "hung" in the Pullman Second Open. It was good to welcome our "walking stick" customer back again for a test of three of their machines. The LMSCA are making serious progress now with the Third Open with a trial of spray exterior paint. The Booking Hall was in creative thought mode as a new winter earner was devised and put on the web shop for a Double Gloucester Driver Experience Day Sunday 17th November with two places sold already! The new Santa leaflet has arrived and this product is also now live on the web site - soon be Christmas! Neil Hardwick advises of the sad demise of Caroline Ellison as the age of 84 who was the granddaughter of Henry and had supplied many photographs for Neil's research into his life. Another quite unusual day as we hosted some 35 photographers for a day with our visiting loco and a short freight train. My thanks go to the train crew that have quite a long day and JHT for acting as our contact with all the visitors. I hope all the energy put in to prepare for the day on Monday will result in some satisfactory results appearing in all the railway magazines. Today's photo is of the photographers preparing for their adventure with us. Mick Thomas kindly collected the repaired starter motors and deposited them in LJB ready for refitting and then tended to the coaling up of 52322 before setting off for a little permanent way work at Shottle with the rest of the team. The LCC gave this week's two car set a clean and ensured the Training Room was fit to receive the artist who will be in residence over the Festival Weekend. There was much refiling of the dmu fleet to ensure the photo charter could proceed without impediment. The Booking Hall and Pullman Buffet Car had quite a good day and the Buffet opened specially this evening for our charter participants. We have another Fish and Chip Special at the Model Railway Exhibition weekend. Again, it will depart at 18:20 from Wirksworth and tickets are priced at £17.00 for a Day Rover and the Special or £7.50 for just the Special on its own. A delightful sunny day here in the Gem of the Peak. We pottered happily up and down to Duffield and to Ravenstor and passengers sunned themselves and their assorted dogs on the platform. Cooke Enterprises got around to putting the gloss coat on the ramp fences, no mean achievement after about 8 years of undercoat. Round the back, Number Three chuffed up the incline to test her new piston rod glands, and duly chuffed back. 52322 was prepared for a some photo work tomorrow and Thursday and will be returning to the Embsay and Bolton Abbey Railway shortly. receiving a partial undercoat of maroon. The bodyside frames for this carriage are also complete and attention will presently turn to the cladding of the south end. Nearby, the DMU team carried on with the Joy of Stores, or the Store of Joys, depending on how one views several boxes of mixed screws, and one's understanding of the term "Whitworth". Back at the station, the mower was applied to the School Embankment and a new feather duster arrived to the bafflement of the cadets who have never seen one and who claimed they were too young to be trained in it anyway. Perkins Stuffers completed 160 or so bags of condiments for Saturday evening's Tunes and Chips Train (nearly fully booked) so that at least you can have some salt on your codpiece. Please note that in the up direction, this is a service train with connections and passengers must be on board by the correct departure time of 18.20. Down the line the Shottle Team completed some 85 feet of top course on the platform to their considerable satisfaction. Fwd: [wirksworths_railway] Progress Monday 2nd September 2013. A bit thin on the ground today with p way setting levels on Shottle platform and a lone patrol person inspecting the track between Shottle and Idridgehay. VCT were busy cutting back trees and brush along Bournebrook Ave apparently to aid tele reception. 2 fires were achieved - the brash not the teles. Mike Billings spent a day with the flail on the incline so sight lines there should be much improved. The class 31 club turned up late on to recover wagons from Shottle to take part in this weeks photo charters with the L&Y loco. Further deliveries of black gold were taken to enable the photo charters to go ahead- the price per ton is obscene I hope the charters cover the cost. Further to my comments on the web site last week there appears to have been some confusion. I was commenting on the Yahoo site NOT the Wyvern site which is of course excellent. I note the Yahoo web site is different again so make up your own minds. The final day of our steam hauled services brought out a pleasant number of passengers on what proved to be a rather chilly day. In addition we hosted a number of vintage cars for a rally, also a private party for a train ride and lunch, as well as a surprise coach arrival for tea and toast following on from the Sunday morning Lycra Cycle Club. 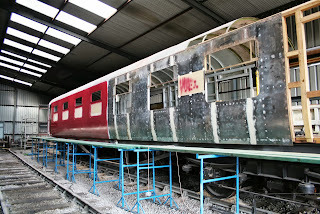 Down the yard, the Third Open received the start of a first coat of primer and the emerging framework of this vehicle is coming along nicely. The DMU team carried on with the Joy of Stores, a book borrowed from Brassington. Nearby, the Passenger Department wore the mower down to a nub on the wideway. After several weeks of toil with a micrometer, the PDLG succeeded in starting the class 33 once again, after its generator return, and a necessary test run was authorised up the incline to the considerable happiness of all concerned, giving us, I hope, a second locomotive once again for the upcoming Diesel Weekend on the 21st and 22nd of September. A steady start to the Last weekend of the visiting steam passenger service on Derbyshire's friendly railway. The duty conscript was kept busy sorting the old wood and cutting the lawns. The miniature railway brought a lot of interest from fellow miniature railway enthusiasts. The Lmsca worked on the third open as well as having a general meeting. The 8f group were in full flow on the duke. The Dmu group sorted out the stores and held their meeting in the afternoon. Special thanks to John today for covering all of the guard turns , Graham for driving Ravenstor and Gorsey bank for the outgoing service. 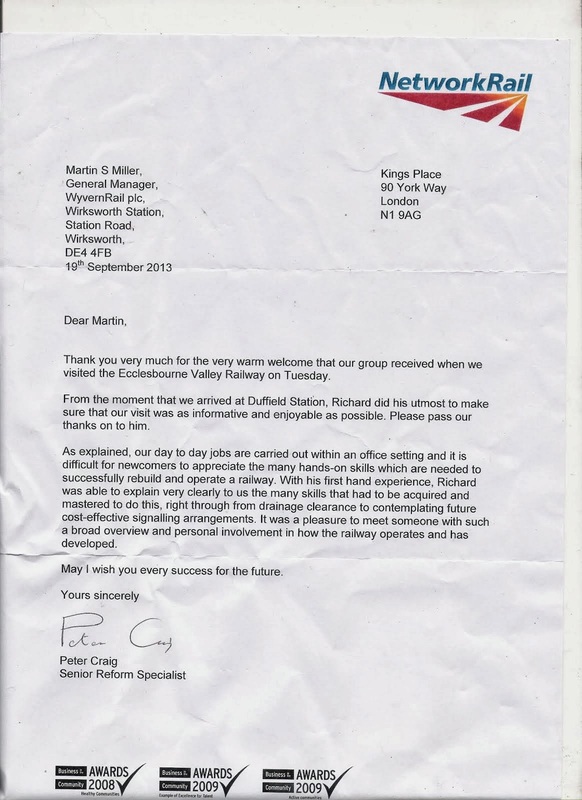 All in all a good day with many comments on being a lovely family railway.